The home-improvement retailer reports earnings next week. Should you beat the crowd? For a long time, Home Depot (NYSE:HD) has stood atop the home-improvement retail industry, delivering impressive earnings growth and favorable prospects even when the housing market wasn't firing on all cylinders. Yet as home prices have climbed at an accelerating rate in recent years, Home Depot stock has risen to new record highs. Some wonder, though, whether the good times can last as the bull market starts to encounter some resistance. With the company set to issue its latest quarterly results next week, many investors are looking to see whether Home Depot is a smart buy right now or whether it makes more sense to hold off for a clearer picture of the economy and the housing market. Let's take a closer look at Home Depot in an attempt to answer that question. With Home Depot's share price tripling in just the past three years, longtime shareholders have already reaped huge rewards for their willingness to stick with the stock through the downturn in housing. In mid-2011, when housing was still stubbornly failing to recover alongside the rest of the economy, valuations on Home Depot stock fell sharply. But investors have subsequently become much more optimistic about the company's prospects, and they have bid share prices up accordingly. While it's no surprise that valuations are higher than they were during the housing crash and the subsequent financial crisis, what is astonishing is that even during the housing boom of the mid-2000s, earnings multiples were below current levels. HD P/E Ratio (TTM) data by YCharts. This indicates that during the housing boom, many investors saw Home Depot's success as a fleeting phenomenon and refused to rely on it continuing indefinitely into the future. Now, however, investors appear more certain that Home Depot will survive in any housing environment. To some extent, investors have every right to be enthused as earnings multiples have contracted because earnings have risen at a faster pace than the stock price. Nevertheless, with the stock still fetching 19 times forward earnings estimates, Home Depot must sustain its growth pace in order to justify current valuations. How has Home Depot stood up compared to its rivals? Home Depot isn't the only company to see similar trends push its stock price higher. Rival Lowe's (NYSE:LOW) has experienced similar expansion in its earnings multiples, and its stock has also climbed close to all-time highs. But Home Depot has some competitive advantages over Lowe's. 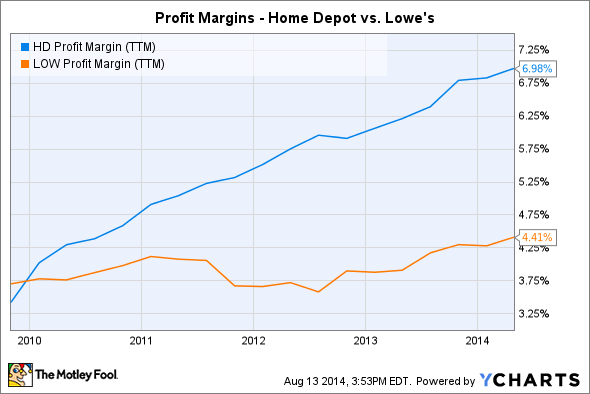 Home Depot has consistently outpaced Lowe's on profit margins over the past five years: From being roughly equal in early 2010, Home Depot now has margins that are better by more than half over its rival's figures. 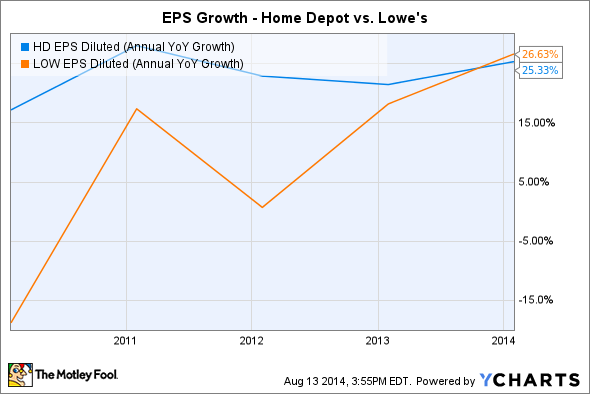 From an earnings-growth perspective, Home Depot has also kept up the pace more effectively. Lowe's has recently caught up to Home Depot with its year-over-year growth rate, but that follows several years of subpar performance from the No. 2 home-improvement retailer compared to the industry leader. HD EPS Diluted (Annual YoY Growth) data by YCharts. Fundamentally, Home Depot expects more of the same going forward. In its most recent quarterly report, the company said it anticipates a 4.6% rise in comparable-store sales for the current fiscal year, outpacing the roughly 4% Lowe's guidance for growth in comps. In addition, Home Depot has proven to be more resilient than some of its smaller niche competitors. Lumber Liquidators has posed a substantial threat in the hardwood flooring segment with extremely strong growth rates over the past couple of years. However, its valuation got ahead of itself, contributing to a pullback of more than half for the stock over the past six months. Decking specialist Trex has seen even faster growth, but from such a small base the company doesn't yet threaten Home Depot or Lowe's and their much broader business models. 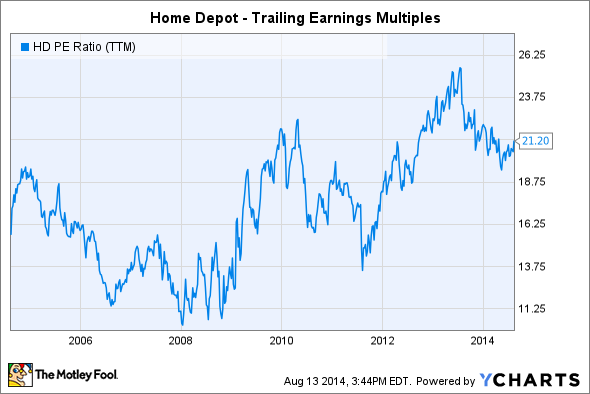 Is Home Depot a smart buy right now? With Home Depot coming off a weak earnings report last quarter, investors will want to see a nice bounce-back after a tough winter held back sales. The key spring season makes up a huge portion of Home Depot's business, so investors who believe the home-improvement retailer will rediscover its former strength should see next week's earnings report as a potential catalyst for further gains.